The Art Feature exhibition included sculptures spanning four decades, all of which convey Edwards’ influence as an American modernist and conceptualist, as well as the artist’s deep-rooted expressions of social justice. This focused version of the gallery’s 2010 solo exhibition, which was widely praised (including Artforum’s “Best of 2010” issue), will be the artist’s first in Switzerland, and first solo exhibition in Europe since the early 1980s. 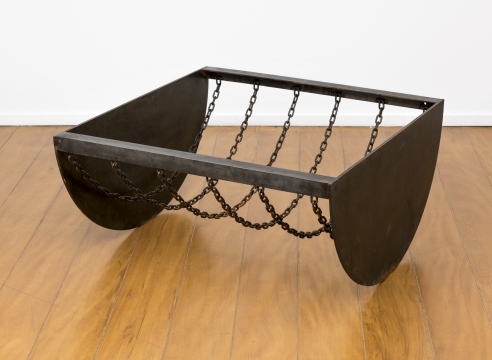 The most recent works display the remarkable range of expression Edwards achieves with his method of welding found objects into mask-like forms—including hammers, chains, and railroad spikes—and how, in the process, he renders violence, humor, and hope from these objects. The gallery presented approximately ten of these works from the 1960s to the present, as well as select pedestal-scaled works. Also included in the exhibition was the large-scale sculpture, August the Squared Fire (1965). This extraordinary work was included in Edwards’ first solo exhibition at the Santa Barbara Museum of Art in 1965, and his 1993 retrospective at the Neuberger Museum of Art. August was included in the Hammer Museum’s exhibition, Now Dig This! Art & Black Los Angeles 1960–1980, part of the Getty Foundation initiative, Pacific Standard Time, a series of exhibitions focusing on the artistic history of Southern California. Edwards was also featured in Crosscurrents in LA: Painting and Sculpture 1950–1970 at the Getty Museum, which will travel to Martin-Gropius Bau in Berlin. In addition to the Art Feature Sector, Alexander Gray Associates presented Melvin Edwards in Art Unlimited of Art Basel.